Rodney Freidrich made it very clear from the start. “I don’t golf,” he said in a gravelly voice that fits his Wild West persona of Sam Pickett. In fact, what Freidrich does is a far cry from golfing. Freidrich competes in a form of competitive shooting that lends itself back to the days of Billy the Kid, Wild Bill Hickok and Wyatt Earp. 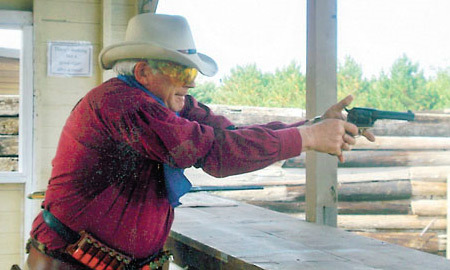 It’s called Cowboy Action Shooting and last weekend Freidrich competed in the Single Action Shooting Society (SASS) Minnesota State Championship in Morristown, Minn. at the Cedar Valley Vigilantes gun club. The shooting tournament is everything Old West — from the personas and guns used to the range the contestants shoot on, a mock-up of a Wild West town.